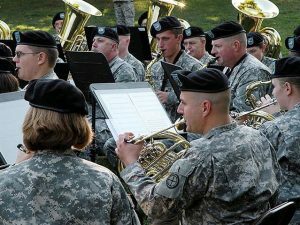 The 35th Infantry Division Band, the official band of the Kansas National Guard, has announced its summer concert series. The free public summer concert series will be presented in a number of communities across the state. Audience attendance for past concerts has averaged from 400-500 people per concert. The Marching Band will be presenting the National Anthem July 4 at the Kansas City-T-Bones game and July 6 at the Kansas City Royals game. All concerts will last approximately an hour and 15 minutes.